• Heavily textured shaft make this toy perfect for those that want a satisfying fullness deep inside ,Pleasure object for women . • Strong suction cup allows to play in the bedroom, living room or bath, hands-free to use, maximumly satisfy your enjoyment. • Material:Silicone , non-toxic and odorless,safe,soft, smooth and flexible with durable shape. 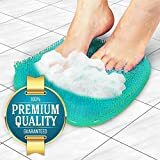 • It is easy to use and clean with cleaner or warm water and soap after used.100% Waterproof . • PRIVATELY PACKAGE - Special courier packaged protect your privacy. Color:two Color:Flesh,BLACK Material:silicone (Medical Grade) Total Length: 7.5"inch Diameter:1.38 inch Waterproof: 100% Warm Reminder: 1. Wash it with a hand soap in warm water to keep it clean. 2. Recommended to use with a lubricant to create a better feeling. 3. Keep it dry and save in a secret place away from children.